WILLIAMSPORT, Pa. - While many fans of the Middle Atlantic Conference may have circled the matchup between first-place foes Albright and Stevenson this week, the Lycoming College football team will have a chance to play the spoiler on Saturday, Nov. 7, at David Person Field when it faces the other team in the three-way tie for first in Delaware Valley University. The Warriors (2-6 overall, 2-5 MAC) are coming off a 48-7 loss at Widener. Senior Ryan Umpleby led the team with 189 all-purpose yards in the game. The Aggies (7-1 overall, 6-1 MAC) are coming off a 28-21 win over Lebanon Valley. Freshman Dashawn Darden threw for 186 yards and three touchdowns to lead the team. • Junior Blake Bowman's 12 rushing touchdowns and 13 touchdowns scored are both one shy of the respective school records. 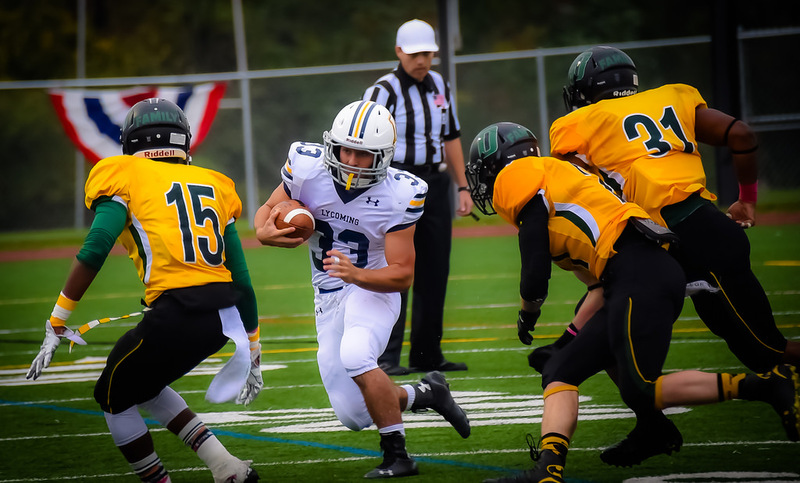 • Senior Ryan Umpleby became the third player in school history to notch 1,000 all-purpose yards three times in a career with his fourth of 189 yards against Widener. • In the past seven years, the Warriors have upset a nationally-ranked Delaware Valley team three times. • Lycoming is 12-6 in the month of November under head coach Mike Clark, including an 8-1 mark in the last three years. • Sophomore Mike Ward is fourth in the MAC with four interceptions. Lycoming is fifth in the MAC in scoring offense (25.0), fifth in total offense (346.5), third in rushing offense (185.3) and sixth in passing offense (161.4). The Warriors are led by a talented duo in junior running back Blake Bowman and senior wide receiver Ryan Umpleby. Bowman leads the MAC in all-purpose yards (148.9). He is second in the league with 13 touchdowns scored and his 116.0 yards per game on the ground is second in the MAC. Umpleby is second in the MAC in all-purpose yards (148.1), fourth in receiving yards per game (56.5), second in receiving touchdowns (5) and second in kickoff returns (22.2). Junior quarterback Chase Whiteman leads the league in yards per pass attempt (7.4) and he is fourth in passing efficiency (123.4). Lycoming is sixth in the MAC in scoring defense (32.5), sixth in total defense (383.3), fifth in rushing defense (135.8) and ninth in passing defense (247.5). The Warriors are 12th in Division III with three defensive touchdowns, as junior Tyler Smith has an interception return and junior Zach Smith and freshman Wyatt Entz each have fumble returns for scores. Sophomore Mike Ward is fourth in the league with four interceptions and second with 12 passes defended. Junior Jon Rummel leads the defensive line, as he is sixth in the league with 0.56 sacks per game. 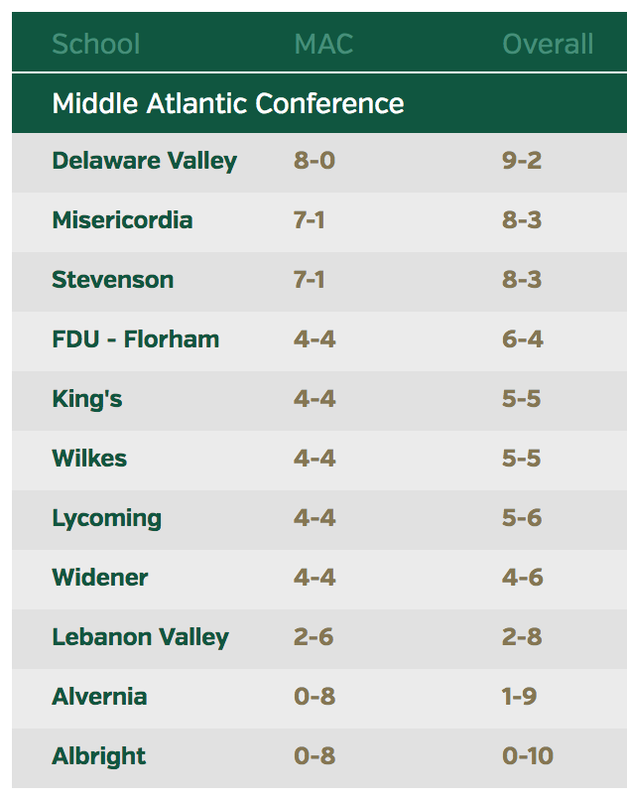 Delaware Valley is fourth in the MAC in scoring offense (25.3), second in total offense (417.1), first in rushing offense (286.4) and ninth in passing offense (130.8). The Aggies bring the nation's eighth-ranked rushing offense to town, a group led by junior Robert Cleveland, who is seventh in the MAC with 462 rushing yards. Junior wide receiver Tyler Bing is also one of the team's top rushing weapons, as he has found the end zone five times this year. Freshman quarterback Dashawn Darden opened up the team's passing game at Lebanon Valley, throwing for 186 yards and three touchdowns, including a 92-yard scoring strike to freshman Eric Shorter that sealed the win. Delaware Valley is second in the MAC in scoring defense (14.9), fourth in total defense (313.3), second in rushing defense (106.6) and fifth in passing defense (206.6). Senior free safety Danny Wynne leads the team, as he is fourth in the MAC with 62 tackles and he has also added two breakups. Sophomore Shawn Miller is second on the team with 52 stops and he has added two interceptions and four pass breakups. Senior linebacker Rashaad Lighty paces the team's game at the line of scrimmage, as he has eight tackles for loss and five sacks. Junior lineman Luke Boonstra also has three sacks. With two games left in the regular season, junior Blake Bowman is one touchdown shy of the school's single-season rushing touchdown mark of 13 set by Tim Deasey (2001), Jason Marraccini (1997) and Craig Needhammer (2014) and one score shy of the single-season record of 14 touchdowns scored set by Needhammer, Deasey and Brian Thompson (1998). Bowman has been aided greatly by back-to-back four-touchdown games against King's and FDU-Florham, as he is the first player in school history to accomplish that feat. Senior Ryan Umpleby continues to rise in the school's career record books. The Forest Hill, Md., native needs 118 more receiving yards to move into third in school history where Ryan Wagaman (2007-10) sits with 2,291 career yards. His 146 career receptions are already fourth in school history and his 19 touchdowns are also tied for fourth. With 1,111 career kick return yards, he is 112 yards shy of the school record of 1,223 set by Craig Needhammer (2011-14). With 3,597 career all-purpose yards, he is 28 yards shy of the top five in school history, where Parker Showers (2009-12) sits. The Warriors picked off a season-high three passes on Oct. 31, at Widener. Sophomore Mike Wardintercepted his fourth pass of the season and freshmen Jarrelle Payne and Khamari Williams each had the first picks of their careers. Senior Ryan Umpleby has teamed with a Warrior running back in each of the past three seasons to post a 1,000-all-purpose-yard-plus duo, as Craig Needhammer '15 had 1,539 yards in 2013 and a record 1,867 in 2014, while Umpleby notched 1,052 in 2013 and 1,223 in 2014. This season, junior Blake Bowman leads the team with 1,191 all-purpose yards and Umpleby is right behind him with 1,185. The Warriors and Aggies have engaged in a series of instant classics in the past four years, with each team winning two games during the series. The Aggies won the first of the four games in 2011, 28-21, with Aaron Wilmer scoring a last minute touchdown to secure the win. In 2012, Tyler Jenny, making his second collegiate start threw a touchdown with 5:14 left to secure a 24-14 win. The two teams engaged in a defensive battle in 2013, with Tanner Troutman securing the 19-16 win for the Warriors with a late-game interception. Last year, Aaron Wilmer threw for 380 yards and five touchdowns to lead Delaware Valley to a 52-42 win.